It's time for the second part of this three part series. This segment will be on the 'middle-children' of uniform designs. They do enough right to avoid being labeled as bad, but very few can truly be considered great designs. There's just too many stripes in this uniform for my taste. On the home uniform there are four colors featured on the side uniform trim (Navy, White, Gray, Yellow). The home uniform is far too busy, with a dual-banded collar, and a yellow outline on the team name and player number. Furthermore, the blue stripe on the shorts circumvents the entire outline of the shorts, a unique look that works on the away uniforms, but not the homes. The away and alternate designs are much stronger than the home uniforms. It evokes a sense of pride with 'Indiana' printed across the chest. For a team whose identity is all about the state they play in, the state name is smartly featured on the alternate yellow uniforms. The main improvement for the entire set as a whole would be removing one stripe on the side trim. It would make the uniform a lot cleaner, and draw more attention to the beautiful symbiosis between the navy and yellow. The Nuggets made a slight change for the upcoming season, tweaking their font and numbering, while still keeping with the navy-baby blue-yellow color scheme. It's a slight improvement, as the font becomes a lot thinner, as does the numbering. What I dislike however, is the off-color band running down the side of the home and away uniforms. While the jersey obviously needed an influx of color, that's a somewhat lazy way to do so. I don't really have much to say about the standard Denver jerseys. They're a neutral set that isn't polarizing in the least. But man, those yellow alternate uniforms. Those things are an absolute work of art. Forget making them the normal road uniform, make the Nuggets wear those every single night! The quad-banded stripe going down the middle of the jersey, coupled with the somewhat 'pixelated' mountain range is both a beautiful design and an homage to years past. The location of the number in the upper right of the jersey is perfect, and allows one to focus on the design. Finally, the stripes show up again on the shorts trim. It's a cohesive piece, with a great color scheme. Like Denver, Houston made some slight tweaks to their uniform for the 2015-2016 season. They added gray to the color scheme, which they used to outline player numbers. It was an extremely bare-bones uniform before, only utilizing red and white, so the gray is a solid attempt to spice things up. But if you're trying to make the uniform more exciting by adding gray, aren't you admitting to having a terribly boring uniform? It's a non-offensive design, which pushes it above teams like the Hawks and Clippers. But that's really all that can be said for the Rockets' standard set. And just like Denver once again, Houston has some beautiful alternates. It begs the question, why would they remove yellow from the color scheme? 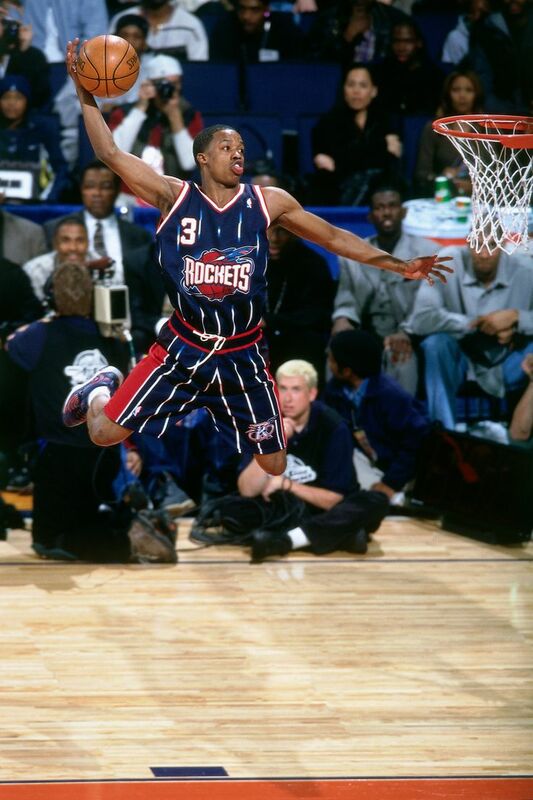 I mean was this uniform really an improvement on the beautiful designs that Hakeem donned en route to a title? The current Rockets alternates seem like throwback jerseys, with some slight adjustments. The font is a slightly more italicized style, but that's the only main difference. It is a clean design which a thick yellow stripe going down the length of the uniform, and it's much improved over the standard red-white-gray design. Luckily for viewers, the Rockets often opt for the alternate jerseys on the road. Hopefully in a few years they'll always wear them. This is yet another non-offensive uniform, but it's not a flawless design either. The home uniform suffers from the same problem as the Pacers' home uniform--it just has too many colors. The trim includes light blue, navy, and yellow, which clashes against the white background. In addition, the font is a multi-colored design that distracts the viewer, and is overly busy. The strongest aspect of the set is on the alternate uniform. The collar and back design is a thick band of navy, which should be incorporated into the standard uniforms. Finally, rather than the grizzly face on the shorts, I would prefer the claw-and-basketball design. It's one of the cooler alternate logos in the league, and the yellow within the logo would help justify the inclusion of yellow on the jersey trim. Sorry Sixers fans, but you guys weren't the top-rated new uniform. I'm unsure what to think of these new uniforms, however. The main difference is obviously the 'Phila' across the main jersey, as opposed to the 'Sixers' that was donned in past seasons. I think this was an unncessary change, and would be more suited to an alternate jersey. In addition, I dislike the red-and-white striped collar and trim, as it is just another source of distraction for the viewer. The Sixers should stick to their strengths, which is the red-white-and-blue color scheme, and the great font they've chosen. I fear they may have taken a step backwards with this design. Well, we've made it past the first half of uniforms, and the Pistons might be the first uniforms I would define as 'good.' They have a minimalist, classic design with clean font, and very little clutter. The only issue I have with any of these is the discontinuity between vertical stripes on the home uniform. I would prefer the designer choose between red or blue stripes, rather than give each real estate on the jersey. This decision is made even weirder when you look at the road uniform, and see standard continuity between the red vertical stripes. Other than that, this is a great uniform. The 'P' logo on the shorts is a great secondary logo, and fir perfectly with the color scheme. It's hard to go wrong with red-white-and-blue, and the Pistons do a good job of distributing these colors. Finally, the Motor City alternates are some of the best in the league. I'm a huge fan of drawing upon a city's identity for a uniform, and having 'Motor City' sewn across the jersey is a great way to do this. It's a great re-interpretation of a strong, and clearly versatile design. 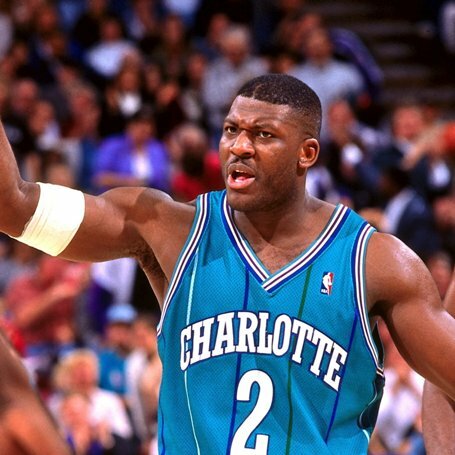 Adding a second alternate uniform for the Hornets' sophomore season bumped them up this list. Even if the Buzz City design includes sleeves, the marriage of teal and black is done perfectly, and well, you just have to love a uniform that says 'Buzz City.' The Hornets have the league's most unique color scheme, with teal-purple-and-white. In addition, the font of the uniforms is chosen perfectly, with jagged letters that remind one of a hornets' stinger. Using teal in the letters, but purple in the numbering on the home uniform is another solid design choice, and a clever way to incorporate a third color. Overall this is an extremely strong set that takes a classic '90s teal design and modernizes it. While they will never be as awe-inspiring as the old SuperSonics unis, the Thunder use blue-orange-and white in a uniquely non-Knicks way (That's not a knock on the Knicks' design, rather praising the Thunder's original jersey). The orange outline on the home jersey, along with the thin orange trim is a great look when added with the somewhat banal blue and white. Additionally, the Thunder logo on the shorts words well within the frame of the home jersey, and uses all three of the team's primary colors. This might be the first uniform where I strongly dislike the alternates. The Thunder's foray into navy is a bad idea, and completely incongruous with the rest of their color scheme. While there is a hint of navy on the away uniforms, nobody would ever say that navy is a 'Thunder' color. So why center a jersey solely around navy? Your guess is as good as mine. While the vertical orientation of 'Thunder' harkens one back to the Bill Walton days, this design is lost amidst a sea of navy. It's a dull color scheme, and is one that OKC would be wise to do away with. Maybe trade it to Houston for one year of Kevin Martin, Steven Adams and Jeremy Lamb, then watch Houston incorporate navy perfectly into their jersey until navy becomes a top-3 color in the league. Yeah, that seems appropriate. The highest ranked of the new uniforms! And what a beautiful design--I would have ranked it higher, but couldn't justify putting an unseen jersey above time-tested classics. The Bucks wisely ditched the red from their color scheme, and replaced it with a cream color that hits all the right notes. The font changed to a more block-letter template, which works well with the stripes that decorate the side of the jersey. Finally, the updated Bucks logo found on the shorts is a great way to subtly include the rebranded Milwaukee franchise. Overall, it's an artfully made, clever design that pushes boundaries in the right places (striped trim), but is minimalist where it ought to be (collar, lettering, numbering). This was so hard to leave off the top 10. It's a design that combines beauty with prestige, and all three iterations of the uniform are great. Putting it outside the top 10 just shows how many strong designs there are in the league (or how biased I am towards other teams). The red-black-and white color scheme is standard across all the designs, as are many other aspects. The Bulls logo on the back and the shorts remains the same on all three uniforms, as does the red-and-white collar and jersey trim. My favorite aspect of the uniform is the absence of any side trim. I have been complaining about jerseys being too busy this entire list, and the Bulls are a shining example of how less is often more when it comes to uniforms. It's a cohesive design, and I love the diamond that cuts into the body of the shorts. Overall, this is a masterpiece, but it just can't break into the top 10.